After four hours, the exhausted refugee came to one more bend and another patch of nothingness. Thoughts turned to her family, husband, father, mother, elder brother and almost everyone else she knew. They were all dead. Her only other friends were those at the army camp. If for no other reason, she owed it to them and the unborn child within her to survive and to tell NATO of the atrocities that had befallen her people. God, she was hungry. Her stomach rumbled while the unborn baby kicked. She staggered as the scene in front became blurred and the trees above began to spin. No, she was not about to give in. Somewhere ahead was her own kind, someone to help. Niana gritted her teeth and rose once more to her feet. Another bend was ahead, more snow, more trees, the weak sunlight and another bend. She stumbled forward and blinked. There was something else. A farm wagon covered in snow was parked on the roadside as if it had pulled over, perhaps to let an oncoming vehicle pass. 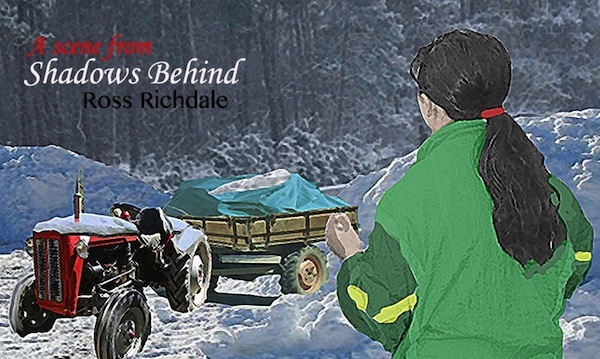 Linked to the front of it, looking so bright in the white world, stood a tractor; a red tractor. Hope surged through her. The depression and fatigue of a second before disappeared as she broke into a slithery run. But all was quiet. Not a sound returned. She reached the wagon and grabbed a canvas cover tied to the wooden side. Shaking with anticipation, she lifted the corner of the flap and gazed into the dim interior. Four enormous brown eyes ringed in terror gazed up at her and children’s sobbing filled the air. Brown-eyed men seem to be more trustworthy than most blue eyed males, but is it more to do with the shape of the face than the color of the eyes? .